Great comics art can transplant you to another place and time. Sometimes it does this through literal display of minute details in order to accurately evoke a particular place (a city, the moon, etc. ), and sometimes the artist accomplishes this transportation to another place through much more indirect means. Sometimes the art in a comic is more like a gorgeous expressionist painting - more than establishing the very minute details of the place, the artist establishes the feelings, the emotions that being in such a place would evoke. Matt Kindt falls squarely in the second camp - he's got an art style that could be considered expressionist, and this style worked perfectly with his recently concluded series Mind MGMT which was all about the tenuous nature of reality, mind control, and the secrets hidden beneath the surface of our lives and reality (I loved Mind MGMT, my review here). So it was with tremendous interest that I took a look at Dept. H, Kindt's new undersea-set series (i.e., "depth"), co-created with his wife Sharlene (she is also the colorist on this book, as she was for some parts of Mind MGMT). 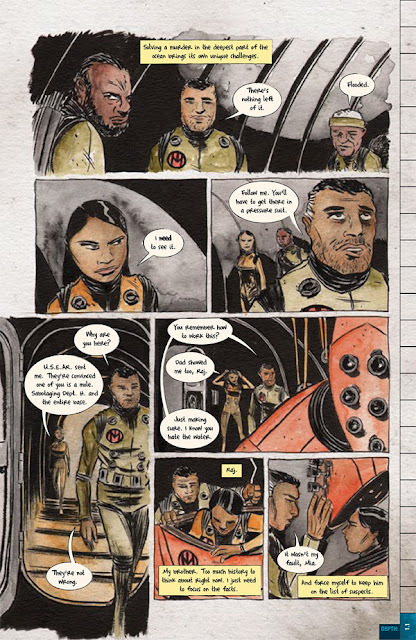 Could it reach the weird heights achieved by Matt Kindt in earlier works? It's impossible to answer that question after one issue, but my main takeaway is that the Kindts aren't trying to top Mind MGMT (which would be a difficult feat), they're instead trying to do something very different and equally interesting. In that, this first issue is a success. 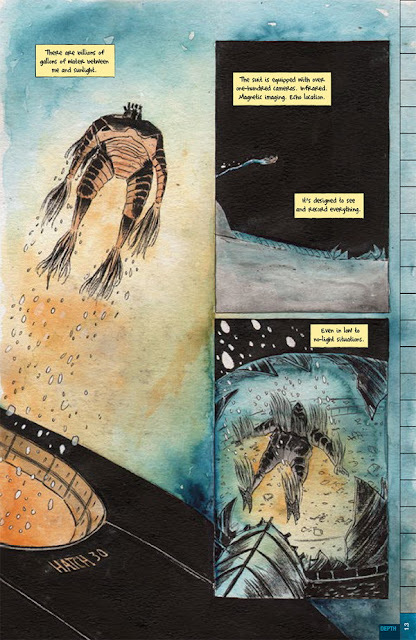 Matt Kindt is a master at creating unusual but very specific atmospheres for his stories and Dept. H is no exception. Dept. H concerns a murder mystery in a base located at the bottom of the ocean. Mia Hardy is tasked with investigating the murder. This is personal for her - it's her father that was murdered and she's got close ties to many of the suspect (on of whom is her brother). Her father ran Department H, a part of the Underwater Science Exploration and Research (USEAR). The issue shows Mia's descent to Dept. H along with the head of security for the base, and her initial encounters with the crew, none of whom seem particularly happy to see her. A good first issue sets the tone for a series, both as far as the specific kind of story the reader can expect and (more generally) the atmosphere and world in which the characters live. The Kindts do excellent work in this first issue of Dept. H, which is a strong story and a definite pickup regardless of whether you've read Matt Kindt's prior work. If you have, particularly if you're familiar with Mind MGMT, it'll be clear from the outset that this story is a departure from that series both in art and in tone. Mind MGMT was about vast conspiracies covering the entire world; that series got to something ineffable about the nature of reality itself. And while the protagonist was also trying to solve mysteries, she was ultimately asking bigger questions about not only who she is, but why the world is the way it is. Dept. H is much more focused, and tight, and personal - it's about the investigation into a single murder at an undersea station by one of seven people. The stakes here are clearly defined; Mia Brady is essentially trapped at the bottom of the ocean with a group of people suspicious of her, and one of whom killed her father. In this scenario, the Kindts have created a situation just about as far from the world of Mind MGMT (or other of Matt's works such as Revolver, which also involves a character wrestling with the question of "what is real") as possible. If some of Matt Kindt's earlier series were all about vague existential dread, deja vu, and the sense that nothing is as it seems, this series seems to be aiming to capture high-pressure tension and claustrophobia. The first issue also captures, both in form and substance, the tightly focused nature of the storytelling. In presentation, the issues of the comic are shown as notes in a journal. 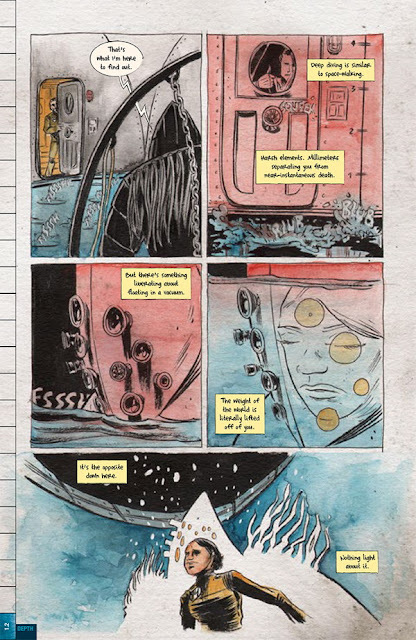 Matt Kindt did something similar in Mind MGMT where the pages of the story were mostly for field notes of Mind MGMT agents; unlike in that story, these notes are not delivered by an unseen narrator with a sense of ominous remove. 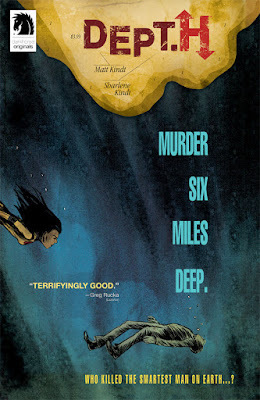 Mia's focus and determination and anxieties are clearly laid out as she investigates murder in the depths. This change in focus and this sense of tension is also clearly reflected in the artwork. Sharlene Kindt has brought a more vivid color, weighty and darker color palate to this book than I've seen in Matt's other work; in the scenes of Mia descending to the bottom of the ocean, the blue of the ocean feels heavy, like you can really see the weight of it pushing down on the very small ship. The vastness of the ocean compared with the ship is striking. The art here also feels like it has a slightly thicker, stronger line, which makes sense in this setting. This is not a situation where the tension is ephemeral and elusive (where reality itself feels like a fugue-like state); the dread is real and the tension is palpable. They're in s metal box with billions of tons of water weighing down on them, someone killed Mia's father, and she's going to get to the bottom of this. This stronger line also really works in showing the characters' facial expressions. Mia has profoundly mixed feelings as she sets out on her mission, and the resentment and outright hostility she gets from the crew of Dept. H is palpable. This tension and the weight (literal and figurative) really comes across in the art, and it makes Dept. H a tight, compelling, emotional first issue.